OLLAGÜE, Chile, Aug 26 2015 (IPS) - Chile, a land of volcanoes and geysers, has started building South America’s first geothermal plant, which would open a door to this kind of renewable energy in this country that depends largely on fossil fuels. The Cerro Pabellón geothermal project is “immensely important for the Chilean state, which started geothermal exploration and drilling over 40 years ago,” but no initiative had taken concrete shape until now, Marcelo Tokman, general manager of the state oil company, ENAP, told IPS. Located in the rural municipality of Ollagüe, 1,380 km north of Santiago, in the Andes highlands in the region of Antofagasta, Cerro Pabellón “will not only be the first geothermal plant in Chile and South America, but will also be the first in the world to be built at 4,500 metres above sea level,” Tokman added. The Italian company Enel Green Power has a 51 percent stake in the project and ENAP owns 49 percent. The plant consists of two units of 24 MW each for a total gross installed capacity of 48 MW in the first phase, but with the advantage of being able to generate electricity around-the-clock. That makes it equivalent, in terms of annual generating capacity, to a 200-MW solar or wind power plant. The first stage would enter into operation in the first quarter of 2017 and a year later another 24 MW would be added. But the plant could be generating around 100 MW in the medium term, on 136 hectares of land. Tokman said that once the plant is fully operational, it will be able to produce some 340 megatwatt-hours (MWh) a year that would go into the national power grid and would meet the consumption needs of 154,000 households in this country of 17.6 million people. He also said it would avoid over 155,000 tons of carbon dioxide emissions a year, by reducing fossil fuel consumption. Sixty million dollars were invested in the exploratory phase, and an estimated 320 million dollars more will go into the plant and the construction of a 73-km power line. Geothermal energy is obtained by tapping underground reservoirs of heat, generally near volcanoes, geysers or other hotspots on the surface of the earth. If well-managed, the geothermal reservoirs can produce clean energy indefinitely. The steam generated is delivered to a turbine, which powers a generator. Brazil has the world’s two largest freshwater reserves: the Guarani and Alter do Chão aquifers. But it does not have geothermal potential, according to a 1984 study, which is currently being revised. Geothermal energy is included in an agreement with Germany to search for alternative sources. Six South American countries form part of the Pacific Ring of Fire, a string of volcanoes and sites of seismic activity with virgin territory for geothermal exploration: Argentina, Bolivia, Chile, Colombia, Ecuador and Peru. In 1988, Argentina built Copahue I, an experimental geothermal plant constructed with Japanese capital, which supplied 0.67 MW but stopped operating. Currently, the country’s energy projects include the construction of the Copahue II geothermal plant in the hot springs of Copahue in the southern province of Neuquén, which would generate 100 MW. In Peru, a preliminary study by the Japan International Cooperation Agency and the Ministry of Energy and Mines found in 2013 that the country has 3,000 MWh of geothermal potential. But so far there are no plans for geothermal plants. In February, Bolivian President Evo Morales announced that starting in 2019 the country would begin to export electricity to neighbouring countries, from the Laguna Colorada geothermal plant. The project, financed by Japan, will consist of two stages, of 50 MW each. The Philippines is home to three of the world’s 10 biggest geothermal plants, followed by the United States and Indonesia, with two each, and Italy, Mexico and Iceland, with one each. Studies indicate that Chile is one of the countries with the greatest geothermal potential in Latin America. This long, narrow country, which forms part of the Pacific Ring of Fire, stretches 4,270 km along the Andes mountains, the earth’s largest volcanic chain. Environmentalists say geothermal energy has a relatively low impact, as long as questions of scale and location are respected. “Geothermal is an unconventional renewable energy source to the extent that it is carried out in accordance with territorial and cultural needs. The energy source in and of itself does not guarantee social and environmental sustainability,” land surveyor Lucio Cuenca, director of the Santiago-based Latin American Observatory on Environmental Conflicts, told IPS. Respecting these parameters, geothermal energy “is a very good alternative for this country,” he said. In the case of the Cerro Pabellón plant, the surrounding communities form part of the Alto El Loa nature reserve, made up of the villages and communities of Caspana, Ayquina, Turi, Chiu Chiu, Cupo, Valle de Lasana, Taira and Ollagüe, which have a combined total population of just over 1,000, most of them Atacameño and Quechua indigenous people. The Alto El Loa Indigenous Peoples Council got ENAP and ENEL to sign a series of agreements for the implementation of social development projects in the local communities in compensation for the impact of the geothermal project, and especially the power line. 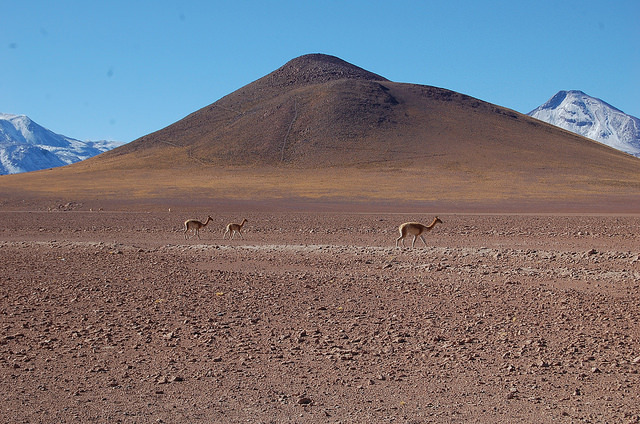 For the inhabitants of Alto El Loa, scattered in remote areas in the Atacama desert, if the project is sustainable and benefits their communities, it will be a positive thing. But they say they are concerned that their way of life may not be respected. “I would like to see more help, and if this is a good thing, then it’s welcome,” Luisa Terán, a member of the Atacameño indigenous group from the village of Caspana, told IPS. “Sometimes we feel a bit neglected and isolated. “But it has to come with respect for our traditions, and it is our elders who are demanding that most strongly,” she added. Others, however, reject the project as “anti-natural” and “violent” towards the local habitat. Chile was a pioneer in research on geothermal potential. 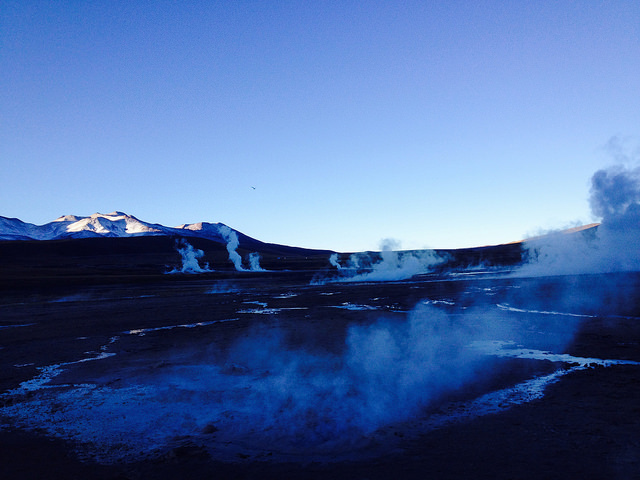 The first exploration was carried out in 1907 in El Tatio, a geyser field located some 200 km from Cerro Pabellón and 4,300 metres above sea level. This country was the third to explore geothermal energy, after the United States and Russia. Two wells were drilled in that area in 1931, and in the late 1960s the government carried out more systematic exploration, which was later abandoned. 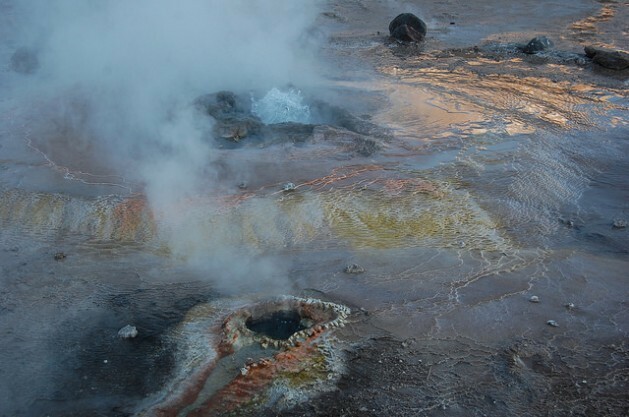 In 2008, the Geotérmica del Norte company, which belonged to the Italian consortium ENEL, began exploration in Quebrada del Zoquete, a few km from El Tatio, using the equipment already installed in the geyser field. In September 2009, a 60-metre high column of steam shot up from one of the wells where the company was extracting and reinjecting geothermal fluids. The anomaly, caused by a failed valve, lasted more than three weeks and led to the government’s cancellation of the permit for further operations. Tokman, energy minister at the time, remembered the incident. “Fortunately all of the safeguards had been taken to demand different instruments of measurement for the project, to ensure that the reservoir was deeper and distinct from the reservoir in the El Tatio geyser field,” he said. Experts warn that geothermal power is not a panacea for Chile’s energy deficit, because if there is one thing this country has learned, it is that a diversified energy mix is essential. But if Chile’s potential is confirmed, Cerro Pabellón could open the door to geothermal development not only in this country but in South America. I am amazed that this is the first in South America! !In El Salvador they have had this for a number of years and have another being built now! !